UNITED NATIONS, October 19 -- In South Lebanon there are only Lebanese and UN troops, said Major-General Alain Pellegrini, Force Commander of the UN Interim Force in Lebanon (UNIFIL) on Thursday. While reporters questioned him about still-alleged weapons smuggling, incursions by Israel and possible anti-aircraft responses by UNIFIL, another question arose. Inner City Press asked, do the soldiers who Russian army engineers brought with them to Lebanon as security comply with Resolution 1701? No, said Maj.-Gen. Pellegrini, not if they are in South Lebanon. On October 4, Russian Defense Minister Sergei Ivanov announced that "Security will be provided by two protection units... composed of experienced professional soldiers from two battalions, Vostok and Zapad, that belong to the 42nd division in the republic of Chechnya." The Vostok battalion, beyond being implicated in human rights abuses in the Avar village of Borozdinovskaya, in September 2006 in St. Petersburg operated as a shakedown squad for one party to a dispute about a meat packing plant and the land beneath. Now they are in Lebanon. But where? Inner City Press question: Russia sent to Lebanon troops it used in Chechnya for something called the (inaudible) Battalion. Various human rights groups have said they are widely accused of human rights abuses and should not be part of the multinational force in Lebanon. I don't know if the United Nations has any comment on that. And also on Anna Politkovskaya's report, which since her assassination has been published and acknowledges torture in Chechnya, whether Louise Arbour [High Commissioner for Human Rights] is going to look at that report or do anything about it. Spokesman: You have to ask Louise Arbour on the journalist who was killed; I think we already spoke from here. And on the issue of the Russian troops I don't have any specific information, and of course as a matter of rule, we do expect any troops that participate in United Nations operations to uphold the highest standards. But can, via a bilateral agreement, troops be introduced into South Lebanon? Maj.-Gen. Pellegrini on Thursday said "no." Developing. Also at Thursday's briefing by Kofi Annan's spokesman, Inner City Press asked if the Secretariat has any response to the Ethiopian Prime Minister's public acknowledgement that there are Ethiopian troops in Somalia. 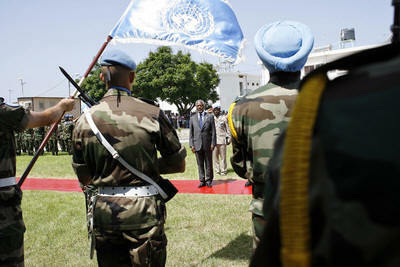 The spokesman repeated a previous, generic call for all parties to respect the UN arms embargo. But while there are certainly other violators, when a head of state says publicly, to his country's parliament, that he is violating a UN arms embargo, shouldn't more than the usual platitudes be deployed? The UN General Assembly, meanwhile, continued Thursday morning with round after round of voting between Venezuela and Guatemala for a single two-year seat on the Security Council. The results are barely changing, and reporters and diplomats have started asking what the president of the General Assembly will do, or asking what her predecessor Jan Eliason might have done. The current president of the GA left Wednesday afternoon and on Thursday gave a speech in Toronto. In New York, the GA is being portrayed as a "theater of the absurd." In the stakeout area outside the GA, Guatemala's representative said he would prefer a single vote in the morning, and one in the afternoon, and that he'll welcome two days without voting next Monday and Tuesday. He'd previously echoed U.S. Ambassador John Bolton is saying that if Venezuela was "honorable" and followed past practice, Venezuela would drop out, since it is behind 105 to 78. But at the noon briefing, two other precedents were raised. In 1960, Poland and Turkey resolved a similar stand-off by agreeing to each take one year of the two-year term. And in 2003, Brazil took two years, followed by Argentina for two years. Neither party in these two cases stood down. Whether the vote tally was closer has been asked of the GA President's spokesperson. We'll see. Inner City Press question: About Turkmenistan. There was a conference this week with UNDP and Turkmenistan. UNDP praised the country and its Government. There's an SG report out, on human rights, and the EU has just refused to ratify a trade agreement on human rights grounds and there's a new law prohibiting marriages with foreigners and the killing of journalists. My question is, what is the connection? The SG's report on Turkmenistan, is this communicated to UNDP? How is it decided with agencies engage with�? UNDP on its web site said they advise Turkmenistan Government agencies. If you have something to say, I'd like to hear it, or at long last have UNDP come to this room. Spokesman: I don't have any of the details of this event involving UNDP and Turkmenistan. I know that you and UNDP have had some issues and you�ve had some trouble talking to them. We will try to negotiate some sort of communication channel between you and UNDP, so you can get your answers to your questions. The reports of the Secretary-General are obviously public documents and, of course, available and known to all agencies and UN country teams. But I don't have the details of this specific event you are talking about. Inner City Press question: Shashi Tharoor, in this room, said that Kemal Dervis, Head of the UNDP, was going to appear by video, but something happened and he was in Rome. I've never actually seen a UNDP person come and brief anyone here. Spokesman: That would be unfair, because there have been people here. Mr. Dervis has been here and briefed the press. That is a bit of an unfair assessment. On Thursday Inner City Press posited that Mr. Dervis has not appeared for a press conference in Secretariat Room 226 since August 2005, fourteen months ago. Giving the questions that are building up, about UNDP's engagement with repressive regimes from Turkmenistan to Zimbabwe to Sudan, isn't it time for Mr. Dervis to take questions? Or for his spokesman William Orme to answer simple written questions in less than two weeks? We'll see.